What is Electrify Your Strings? Electrify Your Strings! 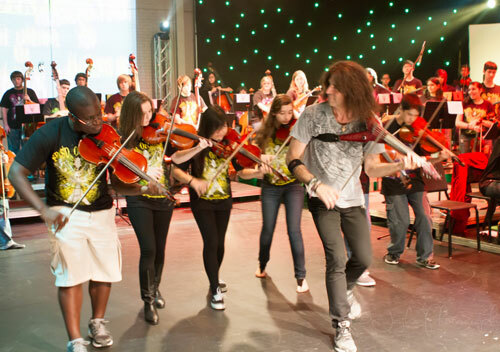 (EYS) is a music education phenomenon that fires up students, teachers, and local communities by injecting a high voltage dose of rock and contemporary, American music into a school’s music education program. 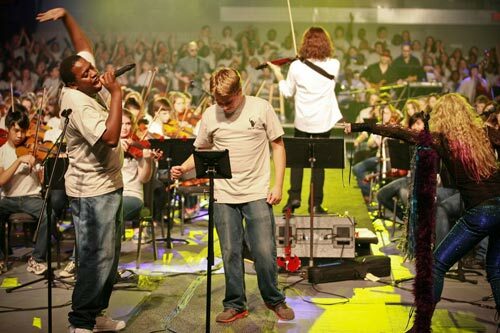 The intensive experience for orchestra, choir, and/or band boosts student self-esteem and motivation, increases school-wide, family and community engagement, and helps raise money for participating schools. 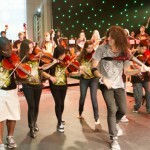 Now celebrating its 10th anniversary of elevating music programs at schools and universities across the nation, the premise is simple – Wood works with a school’s music director to design a tailor-made one-to-two day rock orchestra makeover culminating in a live performance at the end of the experience. 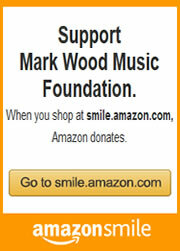 Profits from tickets sold to the event directly benefit the school’s music programs. 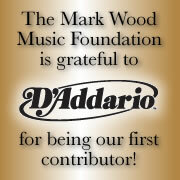 The musical selections are surprising – and include Wood’s own compositions and arrangements of classic rock and contemporary music such as Ozzy Osbourne’s “Crazy Train,” Led Zeppelin’s “Stairway To Heaven,” and the Rolling Stones’ “You Can’t Always Get What You Want.” For schools that want to go all out, Wood and his team (which include vocalist/wife Laura Kaye and their drummer/son Elijah) will also design an accompanying program for the school’s choral department and/or the band department.